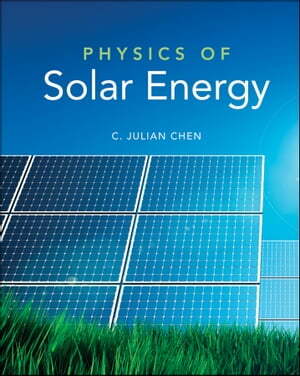 Collins Booksellers - Physics of Solar Energy by C. Julian Chen, 9781118044599. Buy this book online. You hold in your hands the first, and only, truly comprehensive guide to the most abundant and most promising source of alternative energy—solar power. In recent years, all major countries in the world have been calling for an energy revolution. The renewable energy industry will drive a vigorous expansion of the global economy and create more "green" jobs. The use of fossil fuels to power our way of living is moving toward an inevitable end, with sources of coal, petroleum, and natural gas being fiercely depleted. Solar energy offers a ubiquitous, inexhaustible, clean, and highly efficient way of meeting the energy needs of the twenty-first century. This book is designed to give the reader a solid footing in the general and basic physics of solar energy, which will be the basis of research and development in new solar engineering technologies in the years to come. As solar technologies like solar cells, solar thermal power generators, solar water heaters, solar photochemistry applications, and solar space heating-cooling systems become more and more prominent, it has become essential that the next generation of energy experts—both in academia and industry—have a one-stop resource for learning the basics behind the science, applications, and technologies afforded by solar energy. This book fills that need by laying the groundwork for the projected rapid expansion of future solar projects.